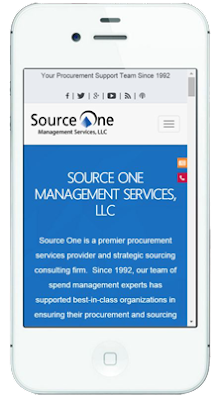 Source One has many great things happening in 2016. Among them - we've just released a White Paper on Predictive Analytics in Procurement, we're attending, speaking at, and being featured at the ISM 2016 Annual Conference this May in Indianapolis, and we're going to continue our tradition of headlining ProcureCon Pharma in the Fall. But most prominently, we're starting off the year by launching a new and improved website. I don't need to explain to The Strategic Sourceror's readers how crucial a role a company's website plays in establishing and furthering its brand. While our previous website surpassed all our goals as far as letting people know who Source One is as a consulting firm, what our procurement and strategic sourcing services are, and all the cost reduction, process improvement, and transformative results we produce - we felt it was time to put a "fresh face" on our web presence. Embracing contemporary design, the new website now makes greater use of embedded menus, negative space, and more thorough use of anchor tagging, inline frames, etc. Arguably the biggest change however, is the new responsive design - which means that the website is view-able on any mobile device or tablet as well as desktops. Now, the website automatically scales itself to the viewing resolution of any device, keeping all functionality with menus, forms, and call-outs intact. We've also added a universal search feature to help people find specific keywords. This mobile-friendly design is a necessary step in keeping our website up-to-date, and making sure that Source One customers can find us no matter where and how they search for procurement and strategic sourcing services. Along those same lines, we're making it easier for people to connect with us on Social Media such as Facebook, Twitter, Google+, YouTube, iTunes, and of course, the Strategic Sourceror blog. 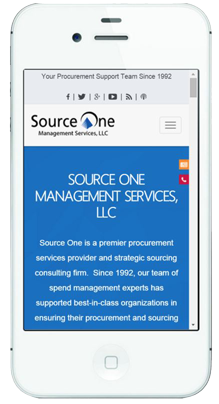 Please take some time to browse Source One's new contemporary, mobile-friendly website, and expect to see a wealth of new content in 2016 about our procurement and strategic sourcing services, our deep category and industry expertise, and our industry-leading results. As we'll be covering, 2016 will be a very interesting year for the Spend Management profession. Stay tuned to Source One's homepage as well as the Strategic Sourceror for all the latest news and insights.